Although this definition may seem straightforward, there is ambiguity around the distinction between a “partial amputation” and an avulsion or laceration. Based on OSHA’s definition, the term “amputation” would require the complete severing of an appendage such that it is no longer attached to the body in any way. Under this definition, it seems that a partial amputation would involve only a portion of an appendage (e.g., half of a finger or toe), but that portion would have to be completely severed from the body (as opposed to an entire appendage being partially severed). OSHA has not provided definitive guidance on this point. OSHA recordkeeping experts have indicated that the main consideration in determining whether an injury constitutes an amputation is the diagnosis of a healthcare professional. Indeed, in our experience, OSHA will view the injury in the manner that it is characterized by the treating healthcare professional. Accordingly, if the treating doctor determines that a finger, still partially attached to a hand, is not a partial amputation, then the incident would not be reportable. Alternatively, if the treating doctor notes in the medical record that the injury is a partial amputation, OSHA will expect the injury to be reported. Although it is unclear how OSHA would classify certain injuries, OSHA has been very clear that loss of the tip of a finger is considered an amputation. The definition of amputation expressly includes the loss of the tip of a finger with or without bone. OSHA does not provide any qualification for what portion of a fingertip must be severed to trigger the reporting requirement (i.e., just a small part at the top requiring nothing more than a Band-Aid versus a larger portion that may require re-attachment). Thus, employers should report any incident that results in some part of the fingertip being entirely removed. In explaining its decision to include this type of injury (which sounds more like an avulsion than an amputation), OSHA stated that approximately half of all fingertip amputations required 18 or more days away from work, and there is a belief that a fingertip amputation is a near miss of a more significant amputation, and a sign of deficient machine guarding or lockout/tagout procedures. When IS the Reporting Obligation Triggered? The new reporting rule requires employers to report an amputation within 24 hours. However, it is not always apparent or communicated to an employer that an amputation has occurred. If an employer or an agent of the employer does not learn about the amputation at the time it occurs, it must notify OSHA of the amputation within 24 hours of when the employer (any supervisory representative) became aware of the amputation. For example, if an employee’s finger is severed at a nip point in a piece of equipment and the employee immediately takes himself taken to the hospital without notifying his supervisor or any other management representative, the employer would not be aware that an amputation has occurred. But as soon as any supervisor of the employee learns of the amputation, the 24-hour time clock begins. Alternatively, the finger may not be completely severed, and it is unclear whether the injury constitutes an amputation. If two days later, the employer receives a medical report characterizing the injury as an amputation, it has 24 hours from that time to report the amputation. Furthermore, it may not be clear initially whether an amputation is actually work-related. Similar to the situation where an employer discovers that an amputation has occurred, an employer must report an amputation to OSHA within 24 hours of learning that the amputation was work-related. For instance, an employee who works from home part-time slices through his finger with a paper-cutter, but it is unclear whether the paper-cutter was in use for work or personal purposes at the time of the incident. If the employer later determines that the employee was using the paper-cutter to assemble name tags for a work related conference he is organizing, the employer would have 24 hours from that time to report the work-related amputation. OSHA explains in the definition of amputation, a reportable amputation can occur naturally at the time of the incident or be performed by a healthcare professional later based on medical necessity. In either case, the amputation is reportable just the same. To be reportable, however, the medical amputation must occur within 24 hours of the work-related incident that necessitated the medical amputation. Conversely, if the medical amputation occurs more than 24 hours after the incident, no report is required. For example, an employee has his finger crushed in a press, and the ER doctor determines that removing a portion of the finger will facilitate a better recovery. However, the ER doctor discharges the employee and directs him to return the next day to see a surgeon to perform the medical amputation. Accordingly, the procedure itself does not occur until more than 24-hours have passed from the incident, and therefore, it is not a reportable amputation. There is no official interpretation in the Preamble or in any subsequent guidance from OSHA about whether an employer must separately report an injury that escalates into an amputation or fatality if the underlying incident was already reported as an in-patient hospitalization. However, a contact in OSHA’s national office who is responsible for the recordkeeping program, has communicated to us that there is no duty to make a subsequent report for an already-reported hospitalization. So if an employer later learns that an in-patient hospitalization had escalated into an amputation or fatality within 24-hours of the work-related incident, and the employer had already reported the incident based on the in-patient hospitalization, a second report need not be made to OSHA. Of course, if both outcomes are known before the initial report to OSHA, both the in-patient hospitalization and the amputation can be reported at the same time. Even if an amputation is not reportable pursuant to OSHA’s Recording and Reporting standard, it may be reportable under 29 C.F.R. 1910.217(g) depending on the circumstances. This standard regulates employee work with mechanical power presses. Under this regulation, an employer must report all point-of-operation injuries to operators of mechanical presses within 30 days of the occurrence of the injury. The point-of-operation is the area of the press where the material is positioned and work is being performed such as shearing, punching, forming or assembling. If one of these processes at the point of operation does lead to an amputation or the need for a medical amputation due to injury, it must be reported under this standard to the Director of the Directorate of Standards and Guidance at OSHA or to the State Agency administering an approved state plan within 30 days. Number of operators required for the operation. If the amputation occurs within 24 hours of the exposure at the point of operation on a mechanical power press, it must also be reported pursuant to the requirements of OSHA’s general injury reporting standard. Understanding when injuries must be reported to OSHA as amputations can be tricky and the importance of proper reporting is critical, particularly in light of OSHA’s newly reissued a nd updated National Emphasis Program (“NEP”) on Amputations. Pursuant to this NEP, if a report of an amputation is received by OSHA and the employer falls into one of the NAICS codes identified in the NEP, the Area Office will conduct an on-site inspection. Thus, an employer should not report an injury as an amputation until it has evaluated the circumstances of the injury and determined that it meets all the requirements for reporting. If the employer determines that reporting an injury as an amputation is required, it should immediately begin preparing for a visit from OSHA. Additionally, when OSHA conducts inspections pursuant to the Amputations NEP, regardless of whether the inspection is triggered by a reportable amputation, OSHA will review the facility’s 300 Logs and 301 Incident Reports for the current year and the previous three years, and look out for and cite recorded amputations that were not reported to OSHA as required. Accordingly, employers should be careful how an injury is characterized on its 300 Log, and not use the term amputation unless it meets the new definition in OSHA’s reporting rule. As OSHA is taking a hard look at amputation injuries, and has now made it a specific injury type that must be proactively reported to OSHA, it is important for employers to identify amputation risks in the workplace and address them by effective machine guarding, comprehensive lockout/tagout programs and training, and understand the nuances of OSHA’s amputation reporting requirements. For more information about OSHA’s new Injury and Fatality Reporting rule, check out this link to a recording of a webinar about the new rule conducted as part of Conn Maciel Carey’s 2015 OSHA Webinar Series, or this earlier article here on Conn Maciel Carey’s OSHA Defense Report blog. 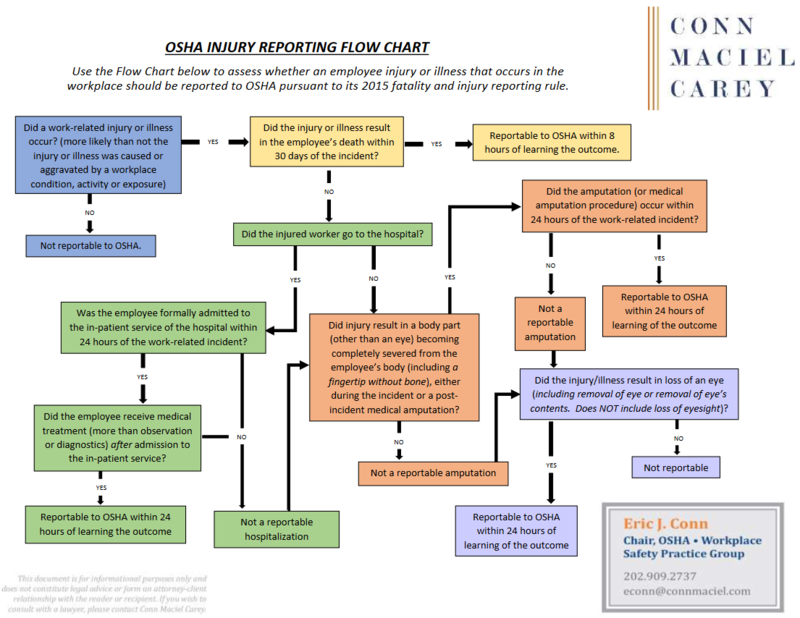 Also, if you need help determining whether an incident is reportable to OSHA, check out Conn Maciel Carey’s Fatality and Serious Injury Reporting Flow Chart. And, of course, if you have questions about: (i) whether a specific incident or injury is reportable to OSHA; (ii) how to make the report; (iii) what information to share with OSHA in the report; or (iv) how to manage OSHA’s response to the report, be sure to reach out to Eric J. Conn at econn@connmaciel.com or by phone at 202-909-2737, or any of the other OSHA specialist attorneys in Conn Maciel Carey’s national OSHA Practice Group. We would love to be a resource for you, and would be happy to provide some free advice around this reporting issue. has this report been updated as to when to report claim in relationship to when supervisor is informed? Thanks for the question, Thomas. Employers have 24-hours from when the employer learns of an amputation or hospitalization that meets the reporting criteria to make the report to OSHA. 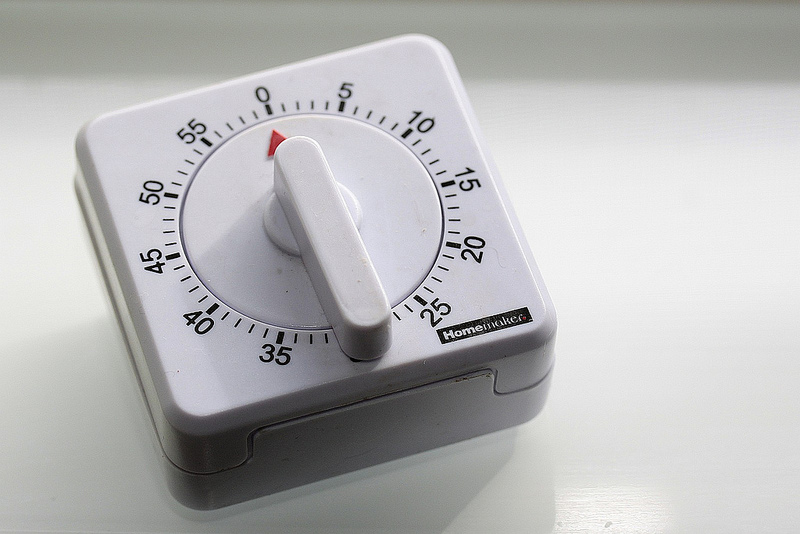 The key event for when that 24-hour clock begins to tick is when a supervisory representative (not necessarily senior management) learns not only about the incident, but that the incident meets the reporting criteria. We anticipate that OSHA and OSHRC will interpret the rule to require a good faith effort to learn the circumstances of an incident; i.e., employers should make reasonable efforts to inquire about whether an injured employee who departs in ambulance is admitted to the hospital, or whether a crushing injury to a finger results in an amputation. 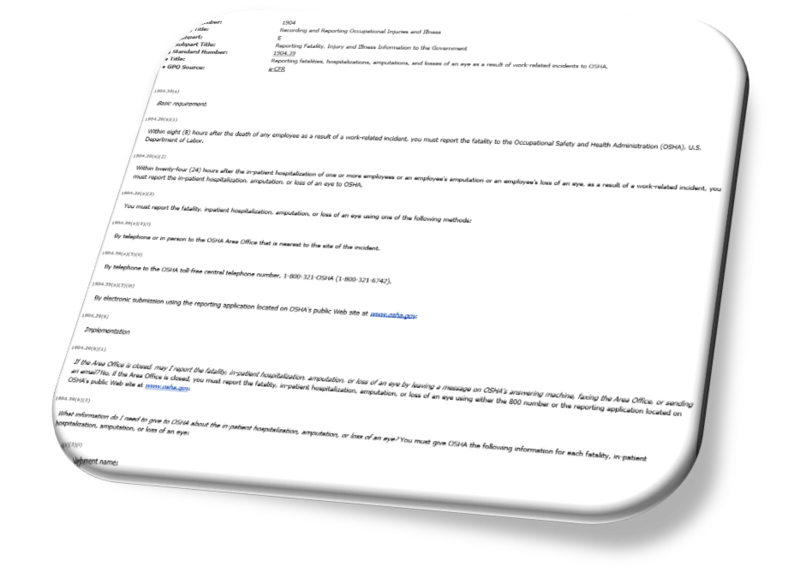 1904.39(b)(7): What if I don’t learn about a reportable fatality, in-patient hospitalization, amputation, or loss of an eye right away? 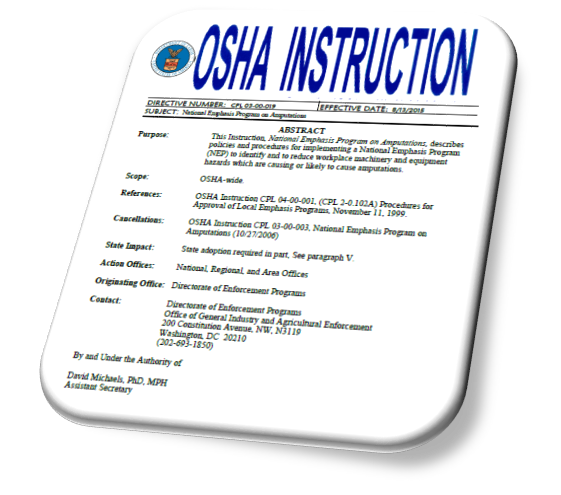 If you do not learn about a reportable fatality, in-patient hospitalization, amputation, or loss of an eye at the time it takes place, you must make the report to OSHA within the following time period after the fatality, in-patient hospitalization, amputation, or loss of an eye is reported to you or to any of your agent(s): Eight (8) hours for a fatality, and twenty-four (24) hours for an in-patient hospitalization, an amputation, or a loss of an eye. 1904.39(b)(8): What if I don’t learn right away that the reportable fatality, in-patient hospitalization, amputation, or loss of an eye was the result of a work-related incident? If you do not learn right away that the reportable fatality, in-patient hospitalization, amputation, or loss of an eye was the result of a work-related incident, you must make the report to OSHA within the following time period after you or any of your agent(s) learn that the reportable fatality, in-patient hospitalization, amputation, or loss of an eye was the result of a work-related incident: Eight (8) hours for a fatality, and twenty-four (24) hours for an inpatient hospitalization, an amputation, or a loss of an eye.